A clip from RAY BLK's "Empress" video. Ray BLK is here to hold it down for the ladies. 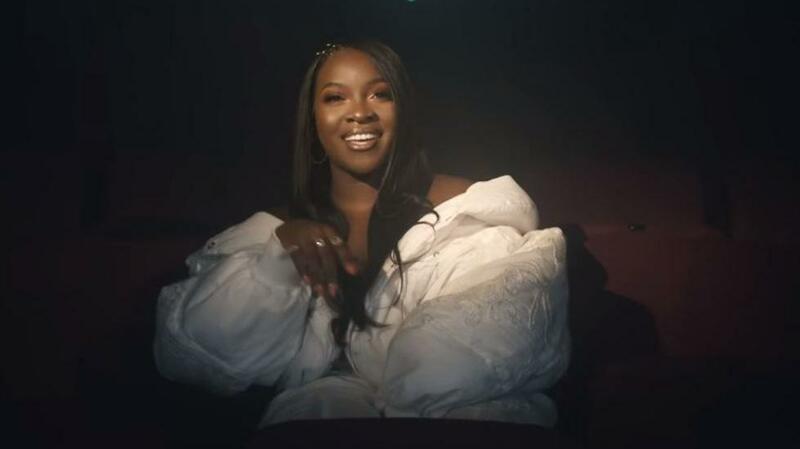 The U.K. artist shines in her new video for "Empress," a cool, calm and vivaciously confident anthem about this woman's worth. The song and Geej Owner-directed video starts off simple enough: Ray recounts a laundry list of suitors who didn't quite match up. But with a flick of her tresses and a bat of her precisely glitter-gilded eyes, the camera pans out to reveal an entire movie theater filled with women — all ages, colors, creeds and ethnicities — nodding and singing along in solidarity. "I don't want to settle for less / 'Cause I'm an empress / Got to big up my chest / Even if it hurts / When a woman knows her worth," Ray sings over acoustic guitar. "Empress" is the lead single off the artist's upcoming debut EP of the same name via Island Records, a project that RAY says is meant to service young women finding their voices. "When I started making this project, I was just in a space where I reached a peak of self-acceptance and self-love," the singer told NPR during an interview last month. "There's a lot of, you know, media telling women not to love themselves, whether that's with advertisement or whether that's with Instagram. There's a lot pulling women down and making them feel not good enough. And I just wanted to uplift people." Empress drops this fall via Island Records.